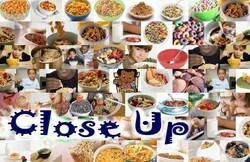 This is an AMAZING Cereal Montage. You won't see anything like this ANYWHERE. Please don't fall for cheap intimations. I am the original. 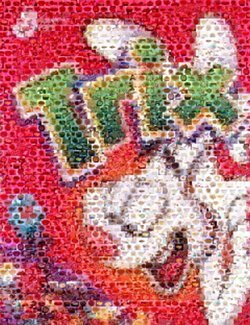 From a distance this looks like a picture of the Trix Rabbit but look closer. Its actually mini-pictures that are 1/4 inch by 1/4 inch with remarkable detail (click on "close up" image). The mini-pictures are 100's of cereal scenes including various brands, bowls, people enjoying their cereal and more. I have gathered and arranged these very carefully myself. This is for the true collector. The entire item is 8 1/2 inches by 11 inches and perfect for framing. I have created this myself. It will NEVER be mass produced. VERY limited edition!! No more than 25 will EVER be released! You will recieve a numbered print that has been hand-signed by the artist. My work has been featured nationally on both Coast To Coast AM & TMZ.com and has been purchased by museums. My art is owned by professional athletes, NFL coaches, celebrities and mixed media/pop art lovers in over 20 countries! My 'playing card mosaic kits' have been labeled The Best Thing on Ebay. Just check my latest feedback to be sure this is a high quality piece of work. If you're not happy I will give a No-questions-asked refund. Check my other Ebay auctions for GIANT 31 X 24 Wall Art editions too, or I can make a custom one for you and let you purchase it through Ebay!! Winning bidder pays $2 shipping.